Helps you prepare for the USCIS Naturalization Test. Is there a better alternative to Naturalization Test? 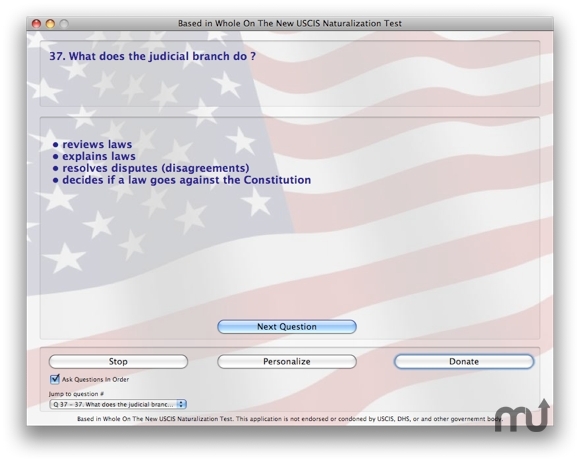 Is Naturalization Test really the best app in Teaching Tools category? Will Naturalization Test work good on macOS 10.13.4? Naturalization Test is a flash card style application containing all 100 of the USCIS Naturalization Test (Civic) questions which you must learn in order to pass your naturalization test. The application also contains all the audio files to assist with your test. Text to speech is used to customize four of the questions which contain state/territory specific questions. The application is FREE, but donations by PayPal are welcomed. Added a 'Learn More' button which provides detailed information on the question being asked. You can have this additional information read to you or just read the text. Naturalization Test needs a review. Be the first to review this app and get the discussion started!